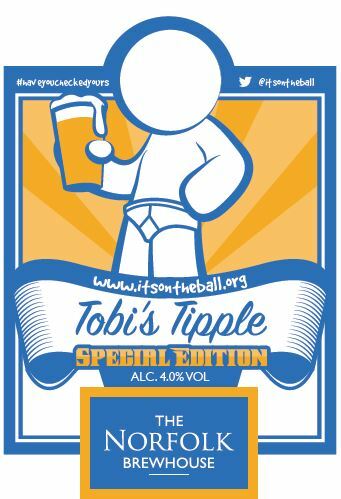 We have joined forces with Norwich based charity It’s On The Ball in a January campaign to raise awareness of testicular cancer, with support from over 70 pubs and clubs across Norfolk and a new beer called Tobi’s Tipple Special Edition. Testicular cancer is the most common form of cancer amongst young men as well as a difficult subject to get men talking about. So creating a special beer, with the support of pubs, seemed like the perfect combination to increase awareness and conversations, whilst also encouraging people into their local in January, often one of the toughest months in a pub’s year. With over 70 pubs and clubs across Norwich and Norfolk supporting Tobi’s Tipple Special Edition there’s lots happening. Some pubs are getting right behind the campaign – donating, organising events and fundraising, including: The Whalebone in Norwich who are donating 10p per pint for every pint of Tobi’s Tipple Special Edition sold during January. The Binham Chequers are donating 30p per pint and hosting Big Willy’s Ball Quiz on Friday 15 from 8pm; indoor traditional fete games from 12noon on Saturday 16 and Big Ball Bingo, eyes down at 3pm on Sunday 17 and The Aldborough Black Boys are having a sponsored head shave. Tobi is the charity’s pants wearing logo (an anagram of IOTB, the initials of It’s On The Ball). His oversized y-fronts have been seen at many events increasing the awareness of the charity and its basic message for men to check themselves monthly. A ‘Pants Wall of Fame’ is a feature on the IOTB website and it is hoped that many more pictures will be added to this during the campaign. Local band The Naked Lights have given their time for free. They will be wearing Tobi pants, and raising awareness playing gigs in the following pubs: Kings Head, Holt on Friday 22 January from 9 pm; Rose Inn, Queens Road, Norwich Friday 29 January from 9 pm; Murderers, Norwich on Saturday 30 January from 9 pm and Plasterers, Norwich on Sunday 31 January from 6 pm. Murderers; Norwich Playhouse; Kings Head, Magdalen Street; Eagle; Ribs of Beef; Coach & Horses, Bethel Street; Harte, Costessey; Leopard; Trafford Arms; Rose, Queens Road; Alexandra Tavern; Wig & Pen; UEA; Plasterers; St Andrews Brewhouse; Angel Gardens; The Jubilee; Bob Carter Centre, Drayton; Whalebone; Duke of Wellington; Sir Garnet and Eaton Cottage. West Norfolk Rugby Club; Dereham Town Football Club; Wiveton Bell; Hunny Bell, Hunworth; Kings Arms, Blakeney; Ship Inn, Weybourne; Vernon Arms, Southrepps; Black Lion, Walsingham; Fakenham Conservative Club; The Pigs, Edgefield; Lawns Hotel, Holt; White Horse, Barsham; Chequers Inn, Binham; Kings Head, Letheringsett; Kings Head, Holt; Black Boys, Aldborough; The Bell, Hempton; Marriotts Warehouse, King’s Lynn; Anvil Inn, Longham; Canary & Linnet, Little Fransham; Coach & Horses, Dersingham; Golden Lion, Hunstanton; White Horse, Longham; Lifeboat Inn, Wells-Next-The-Sea; Peddars Inn, Sporle; Royal Standard, Dereham; Briarfields Hotel, Titchwell; Live & Let Live, King’s Lynn; The Lodge, Hunstanton; The Bull, Fakenham; Three Horseshoes, Roydon; Kings Head, Great Bircham; Chequers Inn, Thornham; Marlingford Bell; Crown, Catfield; Albion, Cromer; Red Lion, Coltishall; Village Inn, West Runton; Recruiting Sergeant, Horstead; Erpingham Arms; Plough, Marsham; Roman Camp Inn, Aylmerton; White Horse, Overstrand; Red Lion, Cromer; Crown Inn, Banningham; Crusaders Rugby Club, Little Melton; Old Kings Head, Brockdish; Wellington, Feltwell; and Willow House, Watton.